Digital readouts for convenient 2-D measurement acquisition. 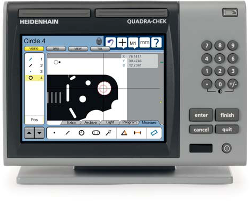 measuring machines if the video edge detection option is selected. The ND1300 has an RS-232-C/V.24 serial interface for communication with a PC. You can connect printers or memory media directly to the USB port. Touch probe ready. Acceptable inputs include 1Vpp and TTL signals.